It is an inherent human desire to live longer and healthy lives while maintaining radiant and youthful looks. Skin is the largest organ of the human body and plays a vital role in thermoregulation, protection from the external environment, sensation related to touch, and acts as an outpost of the immune system. The structural purity, functional and regenerative capacity of human skin are affected by a number of factors that influence its appearance and health. It is a fact that the nutrition and good skincare products, plays a vital and multifaceted role in skin health, beauty, integrity and protection, through multiple pathways and cofactors involved in skin biology. A large number of research findings support the claim that vitamins, essential fatty acids, proteins, and other cosmeceuticals and nutraceuticals are essential for healthy skin. Ageing of the skin is mediated by a combination of the effects of chronological ageing (intrinsic ageing) and environmental factors (extrinsic ageing) on cellular and extracellular infrastructure. Intrinsic (chronological) skin ageing is characterized by atrophy of the skin with loss of elasticity and slowed metabolic activity. The superposition of environmental damage, particularly exposure to ultraviolet radiation (photodamage), on the intrinsic ageing process results, at least initially, in a hypertrophic repair response, with a thickened epidermis and increased melanogenesis (Gilchrest, 1996). Now, let’s understand some of the intricacies surrounding treatment by Botulinum toxin (BOTOX) for erasing expression lines and wrinkles. Let’s not forget that the expression of emotions is fundamental to communication between humans. Since its introduction 15 years ago, BotulinumToxin has revolutionized the cosmetic surgery practice and has become a worldwide phenomenon. Botulinum toxins are produced by a gram-positive and spore-forming obligate anaerobic bacteria found in the soil and known as Clostridium botulinum. The recorded history of botulinum neurotoxins dates back to human exposures to improperly stored food, which caused the sickness known as botulism when ingested. After Botulinum Toxin has been ingested or injected, it diffuses into the human tissue until it selectively and irreversibly binds to the presynaptic terminal of the neuromuscular or neuroglandular junction, where it exerts its actions by cleaving specific membrane proteins responsible for acetylcholine excretion. Botulinum toxin targets and blocks the release of neurotransmitter acetylcholine (Botulinum Toxin in Aesthetic Medicine, 2009). In addition to inhibiting acetylcholine release, Botulinum Toxin also appears to inhibit the release of other important neurotransmitters such as noradrenaline, dopamine, gamma-aminobutyrate, glycine, peptide methionine-enkephalin, as well as the pain nociceptor substance P (MacKenzie et al., 1982) and (Nishiyama et al., 2009). Botulinum toxin even when injected locally, can be distributed over the whole body. Epidemiological studies and clinical studies have reflected the idea that good quality skincare products/ingredients and nutrition is associated with healthy and beautiful skin, and wellbeing. Exposure to harsh detergents and environmental aggressors has been recognized as an exacerbating factor in extrinsic skin ageing. The detrimental effects arise through damage to the lipid barrier, washout of natural moisturizing factor (NMF), increased pH of the skin, and changes in proteases levels and their activities. There are many cosmetic materials that are claimed to have anti-aging effects when used topically. Our understanding of gene-environment interactions should lead to a better use of some topical products, avoidance of others, and the increased use and development of products that can repair the skin barrier (Cork et al., 2009). Sunscreen alone cannot be sufficient to provide optimal protection from ultraviolet induced and other environmental free-radical damage to the skin. Antioxidants vitamins C and E have been extensively researched and proven to protect the skin against photodamage. Collagens constitute a family of proteins present in the extracellular matrix of connective tissues. Vitamin C acts directly on DNA to increase the transcription rate of the pro-collagen messenger RNA, thus helps to regulate and maintain the intercellular amount of collagen. By enhancing collagen synthesis, vitamin C can directly correct the collagen loss that causes wrinkles. Natural vitamin E is the most important lipid-soluble, membrane-bound antioxidant in the body. As a free-radical quencher, vitamin E deactivates these aggressive radicals and terminates damaging chain reactions, protecting primarily the fatty components of cell membranes. CoQ10 positively influences the age-affected cellular metabolism and enables to combat signs of aging starting at the cellular level. As a consequence topical application of CoQ10 is beneficial for human skin as it rapidly improves mitochondrial function in skin in vivo. The use of epidermal growth factors and cytokines in skin regeneration and reversal of extrinsic ageing is emerging as a novel anti-ageing treatment. Phytosterols slow down the aging process by favoring fatty acid desaturation, which in turn maintains membrane fluidity and catalytic activity. γ-Oryzanol, a potent antioxidant extracted from rice, when topically applied, stimulates circulation and sebaceous gland activity, which slows down with age. The skin permeability barrier is mediated by a mixture of ceramides, sterols, and free fatty acids arranged as extracellular lamellar bilayers in the stratum corneum (Mao-Qiang et al., 1993). Thus, inhibiting the epidermal synthesis of any of the three key lipids (ceramides, sterols and free fatty acids) that form the extracellular, lipid-enriched membranes of the stratum corneum, results in an impairment in barrier homeostasis. The skincare products and anti-ageing moisturizers, which contain high percentage of silicone oils, would not contribute to epidermal synthesis of three key lipids, as silicone oils can provide protection only through skin occlusion. Epidermal lipids play important roles in cell structure, in control of growth and differentiation, in determining cohesion and desquamation, and in formation and function of a permeability barrier (Wertz, 1992). Application of a moisturizer to the skin induces tangible and visual changes of the epidermis (skin surface). The ratio between oil and water is important, as well as the type of oil and the amount and type of other ingredients (emulsifiers, humectants, etc). The combination and selection of substances influences the initial and after feel of the product. Today’s ideal image for women is young and youthful, very slender and wearing the fashions sported by the film stars, models and media idols whom we see several times each day, irrespective of whether or not we choose to do so. Enhanced by the clever application of makeup products, complexion of the ideal woman is smooth and beautiful. And so what are the advantages of emulating the current media-culture ideal of beauty, as much as one is able to? Those who most closely approximate the ideal, although they may serve as objects of comparison and envy by the less-favored, nevertheless have personal, social, and professional advantages, as many social sciences studies have shown. This is further demonstrated by the fact that billions of dollars are spent yearly on cosmetic surgery procedures. 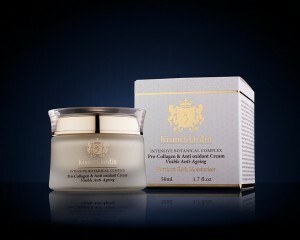 Kismet Jardin skincare products contain skin nourishing compounds, essential fatty acids, sterols and antioxidants. Kismet Jardin through its excellent cosmetic products, and by raising the awareness about the vital link between nutrition and healthy ageing, presents an alternative approach to anti-ageing beauty. Cork, M. J.; Danby, S. G.; Vasilopoulos, Y.; Hadgraft, J.; Lane, M. E.; Moustafa, M.; Guy, R. H.; Macgowan, A. L.; Tazi-Ahnini, R.; Ward, S. J. Epidermal Barrier Dysfunction in Atopic Dermatitis. J. Invest. Dermatol.2009, 129, 1892–1908. Gilchrest, B. A. A Review of Skin Ageing and Its Medical Therapy. Br. J. Dermatol.1996, 135, 867–875. MacKenzie, I.; Burnstock, G.; Dolly, J. O. The Effects of Purified Botulinum Neurotoxin Type A on Cholinergic, Adrenergic and Non-Adrenergic, Atropine-Resistant Autonomic Neuromuscular Transmission. Neuroscience1982, 7, 997–1006. Mao-Qiang, M.; Elias, P. M.; Feingold, K. R. Fatty Acids Are Required for Epidermal Permeability Barrier Function. J. Clin. Invest.1993, 92, 791–798. Nishiyama, Y.; Yokoyama, T.; Tomizawa, K.; Okamura, K.; Yamamoto, Y.; Matsui, H.; Oguma, K.; Nagai, A.; Kumon, H. Effects of Purified Newly Developed Botulinum Neurotoxin Type A in Rat Prostate. Urology2009, 74, 436–439. Wertz, P. W. Epidermal Lipids. Semin.Dermatol.1992, 11, 106–113. ‹ Exotic Natural Perfumes & Visible Anti-Ageing with Natural Alternatives to Botox. Free Prizes!